Naar, professor of Sephardic Jewish studies at the University of Washington with a family background in Salonica, has achieved something of signal importance with this volume. He has assembled a uniquely detailed profile of a leading Sephardic community under the Ottoman Empire and the succeeding Greek national state out of archives in Russia, Greece, Israel, the United States, and Spain. For centuries, the port of Salonica on the Aegean hosted the most influential Sephardic city in the world. Many of its Jewish residents spoke a form of Judeo-Spanish that had been brought to Ottoman territory after the expulsion of Spanish Jews in 1492. Because its waterfront—one of the great maritime assets of the Ottomans—shut down completely on Saturdays, it was known as "Shabatopolis," a "Jewish republic" within the Ottoman Empire. Loyalty to its Muslim rulers extended so far that a prayer for Sultan Abdul Hamid II (r.1876-1909), delivered in 1900, praised the ruling power as a "kosher kingdom." In the aftermath of the city's conquest by Greece in 1912, Salonica's population included as many as 90,000 Jews, who arguably comprised a majority. The community boasted an extensive network of synagogues, schools, welfare institutions, and political groups as well as, in 1929, seven daily newspapers in Judeo-Spanish. The synagogues of Salonica reflected the origins of the refugees who established them—six were named for cities in Spain, four traced their history to Portugal, and nine were founded by Jews who had come from Italy. But even before the arrival of these Italian and Iberian refugees, Salonica had a congregation of Romaniote, or Greek-speaking Jews, whose history began with the Byzantines. At the end of the nineteenth century, thousands more Jews began arriving from Ashkenazi Poland, Romania, Ukraine, and other East European lands from which they fled the growth of anti-Semitic violence. Throughout the book, Naar focuses mainly on the tensions between assimilation, separatism, and the Jews' desire to maintain a communal identity. Relations between the Salonican Jews and Greek authorities were clearly not as favorable as they had been with the Ottomans. For one, Greece promoted Athens and its port, Piraeus, to the detriment of Salonica and its commerce. Nonetheless, Orthodox Christian Greece, having annexed Salonica, was compelled to continue the millet system of representation instituted by the Ottomans, in which Jews (and Christians) were granted considerable self-governance. 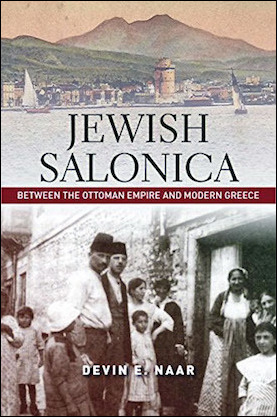 With the end of Ottoman rule, and the assumption of Greek citizenship by the Salonicans, the Jewish community preserved a considerable degree of autonomy until the Holocaust, at which time, Jewish Salonica was effectively wiped out. Related Topics: Jews and Judaism, Turkey and Turks | Stephen Schwartz | Summer 2017 MEQ receive the latest by email: subscribe to the free mef mailing list This text may be reposted or forwarded so long as it is presented as an integral whole with complete and accurate information provided about its author, date, place of publication, and original URL.